Definition - What does Hasta Uttanasana mean? Hasta uttanasana is an asana that is a routine part of the Surya Namaskar series. This particular pose is also used in yoga practice to warm up and strengthen the spine, as well as to open up the chest and heart to allow for deep, full breaths. 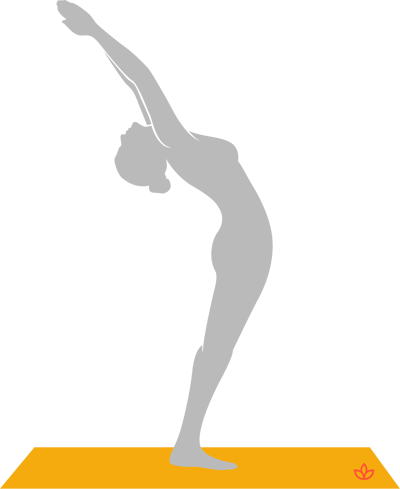 To perform hasta uttanasana, the yogi begins in tadasana. Then both arms rise up overhead with palms meeting, tilting the head, neck, and upper body gently backward while gazing up at the thumbs. Hasta uttanasana is also known as raised arms pose in English. In Sanskrit, hasta refers to the hands and uttana means "turning upwards." When putting this pose into practice, the spine is gently curved with the gaze pointing upwards toward the raised hands, encouraging the heart and ribs to open up towards the ceiling, allowing for full breaths which increase oxygen flow. Hasta uttanasana is routinely practiced as the second and 11th pose within the Surya Namaskar sequences that are in Hindu worship of the solar deity, Surya. In this asana, arms raise in salute to the sun, opening the heart to receiving its energy.